Pileated Gibbons (Hylobates pileatus) [also known as Crowned Gibbon or Capped Gibbon] have a relatively small range and are found in parts of Cambodia, Laos and eastern Thailand. 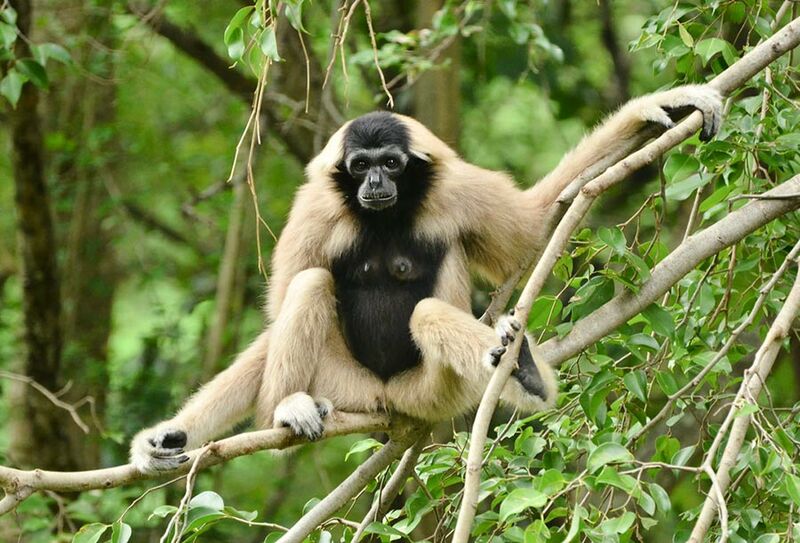 They are similar in size to the White-handed Gibbon (Hylobates lar) but are noticeably different in appearance. Both sexes have distinctive shaggy tufts on the sides of their heads and females have striking white/grey fur with a dark black face and underparts. One of the diagnostic vocalisations of this species is a complex series of low-high bi-phasic notes often given by males which ends with a brief phrase of lower-pitched bubbly notes. The female great call is also unique – a series of sweeping notes which rise, accelerate, then decelerate, rise again, and taper off. When duetting with the female great call, males contribute a rapid series of notes similar to the great call of female Mueller’s Bornean Gibbon (Hylobates muelleri) and frequently add one of the aforementioned bi-phasic series to complete the duet. B10h A male singing in Khao Yai National Park, Thailand. This cut includes several examples of the distinctive low-high bi-phasic series with bubbly trailing notes. HP2 An example of a female great call with male calling in the background. HP1 Male-female duet including great call. 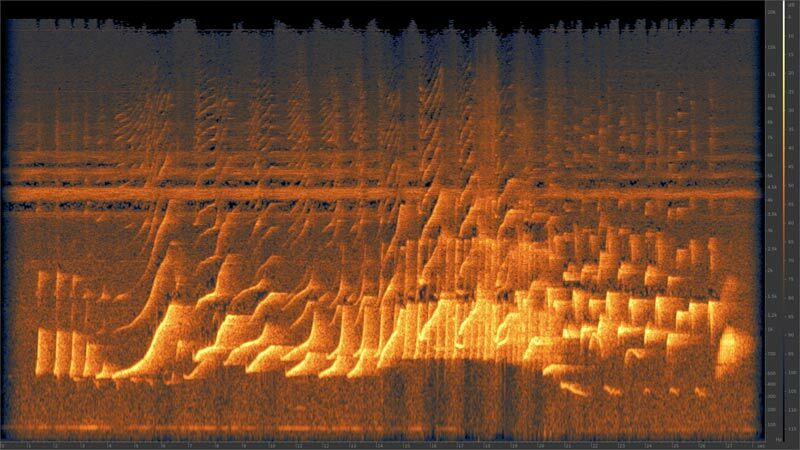 Spectrogram showing Pileated Gibbon (Hylobates pileatus) female great call along with male contributing rapid notes in background and final bi-phasic series with bubbly phrase at end. 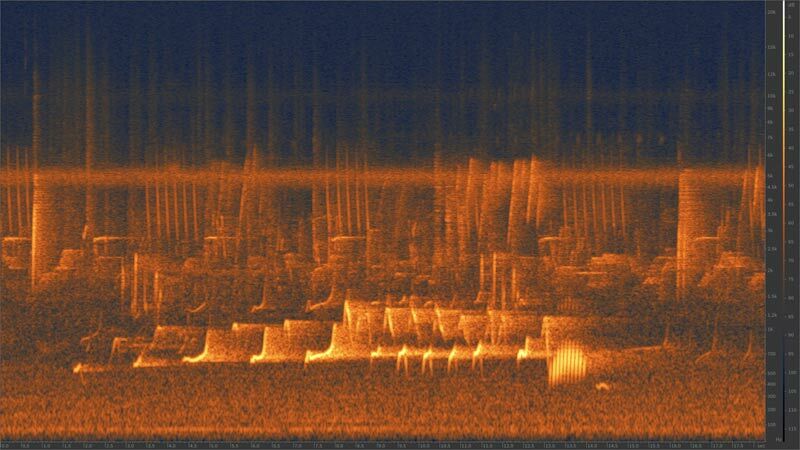 Spectrogram showing male Pileated Gibbon (Hylobates pileatus) bi-phasic series of notes which ends with a brief phrase of lower-pitched bubbly notes. 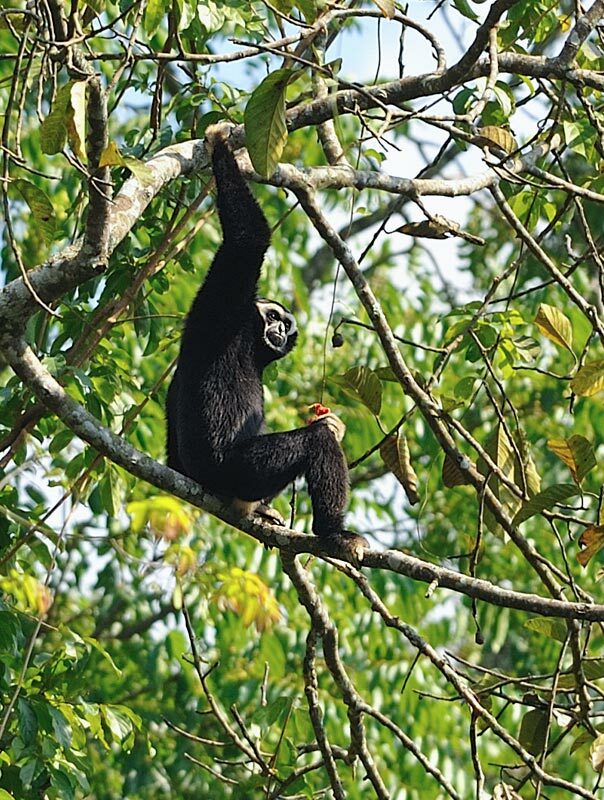 As a result of widespread deforestation and hunting throughout much of its range, Pileated Gibbon populations are decreasing and are now considered endangered. Female Pileated Gibbon (Hylobates pileatus) showing the distinctive shaggy tufts on the side of the head along with the contrasting white fur on the limbs and back, with black fur on the face and underparts.